It’s winter. Outside, it’s cold. I’m off the ‘winter tyre’ soap box from my last news piece – well it’s back in the cellar – and now I think I’m about to get stuck on my ‘how to drive in wintry weather’ high horse. Let’s face it, sometimes the old fashioned methods are good to fall back on. As long as they don’t drop down dead from the cold, horses could even get you where you want to go when good old technology fails! Though let’s face it, nowadays chances are it’s just you, the road and your car. Did I mention it’s cold? Winter conditions are just more difficult when you’re out and about, driving around. You see things – things you’d rather not be aware of. Cars skid. Your windscreen wipers had better be in good condition, or your vision will be impaired by snow, hale and rain. Are the roads gritted? Carefully plan your route – it’s much more likely that major roads will be clear of ice. Think of road conditions – drive more slowly and keep a safe distance between yourself and other drivers. If they have to stop suddenly, you will have to do the same. By braking hard you sharply increase the risk of skidding. If someone insists on driving up your rear end, then let them go ahead of you – keeping safe is what matters. If this isn’t possible then increase the gap between yourself and the car in front. Slow down in advance of junctions and bends, and bear in mind that ice takes the colour of its back ground, so it is hard to establish whether it’s there. More often than not, you won’t know until you are already driving on it. So if you can’t avoid skidding, then know how to do it as safely as possible! If you are unfortunate and you skid, do not brake hard, but slowly and gently. Often you can get out of it by releasing the brake and accelerating lightly. When skidding sideways, make sure you gently turn your wheel to the skid’s direction. In other words, if your rear wheels are sliding to the right, steer your wheel to the right and vice versa, but be prepared to turn your wheel again in the opposite direction, if necessary. Immediately turning the wheel against the direction in which you are skidding would just create more inertia for the car to keep on going. Wait until you feel your tyres have grip again, before attempting to brake or accelerate away. Oh, and at the expense of seeming repetitive – the best grip is provided by winter tyres. When travelling by car in winter, plan ahead. Give yourself enough time to get there and on longer journeys make sure you know what driving conditions are like at the other end. Do people know you’ve left, and what time you’re due to arrive? What would you do if you got stranded? Take an emergency kit in the boot. A tow rope, warm clothes, blankets, a shovel, a picnic basket! (OK, it’s cold, but you still need to eat, and just think, your drinks will be nice and cold! Soft drinks, obviously). Oh and take sun glasses, snow glare can be blinding – light reflects off snow and ice. So you’re equipped for the long haul. Do you have a fully charged mobile phone, in case you need to call or text someone for help? Does your sat nav work OK? You need to know where you are, in case you must let someone else know. 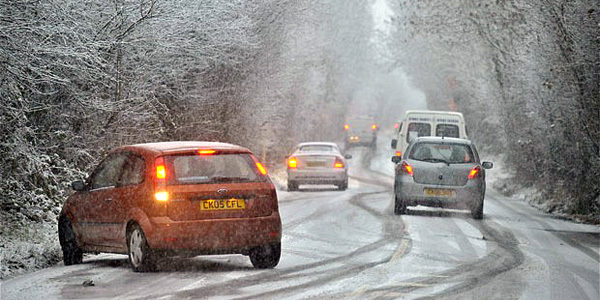 If you get stuck, leave the engine on for ten minutes to warm up the car, then switch it off to preserve the fuel. Clear the exhaust pipe of any snow – if you’re not on a main road maybe leave the car and wear a reflective vest to flag down help. I know, I know – this is all sounding a bit like mountain rescue. Did I tell you to put a reflective vest in the boot with your emergency rescue kit? This may all sound over dramatic, but safety first. Work out where you’re going. Make sure people know. Then get a safety kit together – you can pack it, put it in the boot – and hopefully never use it. From one driver to another – happy winter driving! At Mercedes Chauffeur Hire we know nothing beats safe driving.